OK, Im back home now. Kathleen stayed in San Francisco for the week. Aaron gained another 20 grams today; now hes at 1240. Hes cookin! Kathleen had her 6-week (more or less) postpartum check-up with Dr. Katz yesterday afternoon. All went well; Kathleen is fine. We spent quite a few minutes with Dr. Katz, reviewing what had happened and why. Dr. Katzs summary of what happened is that Kathleen had preterm contractions beginning about a week and a half before Aaron was born (youve heard that story already). Then, he surmises, Kathleen had a placental abruption, meaning that a corner of the placenta began tearing away from the uterus, about 24 hours before Aaron was born. He does not think that this placental abruption caused the initial preterm contractions, because if the abruption had been a week and a half old, he would have have been able to see the obvious week-and-a-half old clotting on the placenta. Instead, he saw what he believes was just a recent abruption and clotting on the placenta, which probably occurred the day before Kathleen gave birth, and which probably caused the painful contractions that she had for 24 hours prior to delivering Aaron, as well as the bleeding on the morning of Aarons birthday. He said that the painless preterm contractions, like the ones Kathleen had initially, are usually able to be kept under control with medication and bedrest. He feels that the abruption is what kicked things into high gear, ultimately causing Aaron to be born. During our discussion Dr. Katz mentioned that todays chances of survival for a 25-weeker are 50%. I asked what the chances are for a 24-weeker, like Aaron, and he said less than 50%. (His book, written back in 1988, had put them at 17%.) When we told him how well Aaron was doing now, he smiled and knocked on his (wooden) desk. Before leaving the hospital this morning, I was able to hold Aaron for about 45 minutes. 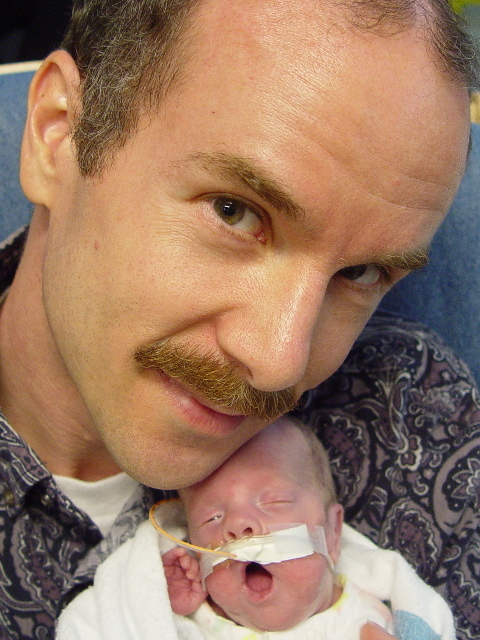 He seemed to enjoy being held; his blood oxygenation stayed at a good level using just a nasal cannula, with a little help from the ambu-bag once in a while. Heres a picture that Kathleen took of me and my baby boy this morning.